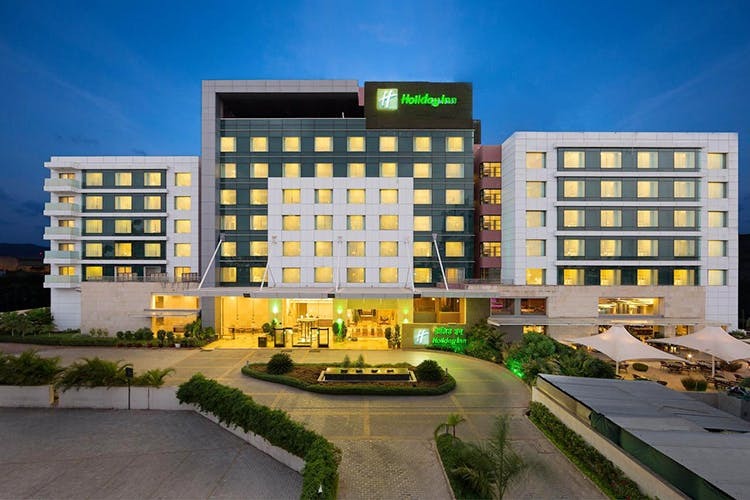 The Holiday Inn at Hinjewadi is a popular choice of hotel for those visiting or working at the tech parks at Hinjewadi, and the sports stadiums at Balewadi. This 4-star hotel promises a combination of comfort and luxury, with stellar hospitality. Located just off the Pune-Bangalore Highway and minutes away from the Pune-Mumbai Expressway, the hotel sits on the outskirts of Pune. The hotel offers accommodation in the form beautiful rooms, come giving you access to their exclusive ‘Executive Lounge’, serving complimentary breakfast, coffee, and tea, as well as two hours of cocktails in the evening. All rooms come equipped with an ergonomic workspace, an entertainment center and a lot more. However, while it might seem like the kind of place someone would stay at on a business trip, we were thrilled to hear that they have one of the few indoor pools in the city. Other recreational amenities include an outdoor pool, a gym, sauna, spa, and an on-site barber/beauty shop. We hear the ‘world cuisine’ at their all-day dining restaurant Cafe Bay Leaf is quite good. If you’re looking for something different, grab a drink and some finger-food at Felix Bar, or enjoy coffee and gourmet treats at the more informal ConneXions Lounge and Bar. The Holiday Inn at Hinjewadi isn’t close to any other restaurants or malls, but you can just as easily take a taxi from here to Baner or Aundh. We think it’s perfect for a long-weekend stay-cation when you can’t head out of the city. Room fares aren’t cheap, but they offer value-for-money service, as well as complimentary breakfast buffet. There are also banquet/meeting rooms available for large social or corporate events.